I used to follow the same routine for delicata squash that I followed for most winter squash: cut one in half, scrape out the seeds, roast it, then scoop the flesh from the skin and eat it. This technique was a little cumbersome, but because I love the sweet flavor of this winter squash, I went along for years thinking it was fine. Then I learned a trick from the clever people at Tastebud Farm: Cut the squash lengthwise into quarters, scrape out the seeds, then slice the squash into bite-sized, moon-shaped pieces, about 1/3 inch thick each. 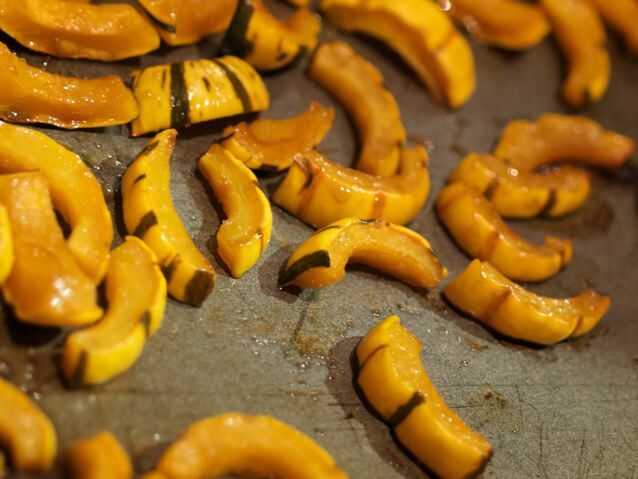 You can roast these in a 425-degree oven for 15 to 20 minutes, turning once (my favorite), or sauté them like zucchini. When it's well cooked, the delicata skin is easy to eat — and tasty too.